The tornado which struck the Oklahoma suburban town of Moore on the 20th of May looks likely to become the largest single catastrophe insured loss event of the year on U.S. soil. The U.S. National Weather Service (NWS) has now upgraded the severity of the tornado, saying that evidence shows that it was an EF-5 event with winds of at least 200mph, the first tornado to reach level 5 on the enhanced Fujita scale in 2013. The NWS also said yesterday that the track of the tornado was 17 miles long, that it was on the ground for approximately 45 minutes and the twister’s path was 1.3 miles wide. More on the path of the tornado and the width of the track further down this article. Oklahoma Insurance Commissioner John Doak told Reuters in an interview that losses from the Moore tornado were likely to be greater than those suffered in the Joplin tornado in 2011. The Joplin, Missouri tornado event in May 2011 resulted in an insured loss of at least $2.2 billion, the number is still rising as claims still get settled. If this is accurate then Monday’s tornado could become the largest single tornado loss that insurers and reinsurers have ever suffered. Separately, Wall Street analysts from Morgan Stanley have estimated that property casualty insurance companies are likely to face at least $2 billion of insured losses from the event. Comparing the damage caused by Monday’s tornado event to the Joplin and Tuscaloosa 2011 tornadoes led them to this estimate. The track, or path, of the tornado is important in estimating potential damages and insured losses. Risk modelling firm AIR Worldwide provided some insight into how the width of the tornadoes path could have a huge impact on the level of losses. 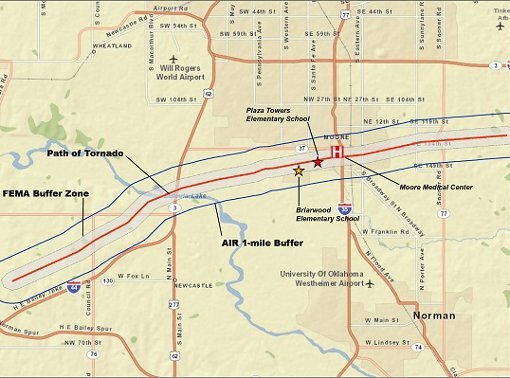 AIR said that it estimates the replacement value of properties within a 0.4-mile buffer zone around the track of the tornado (for a total width of 0.8 miles) at $2.2 billion. Within a 1-mile buffer zone of the storm track (for a total width of 2 miles), AIR estimates a replacement value of $6.4 billion. The graphic below shows these buffer zones. AIR said that the two buffer zones, and the differing estimated replacement value associated with each of them, reflect the uncertainty in the exact size of the tornado.The National Weather Service has now said that it believes the tornado path to have been 1.3 miles in width, which could put as much as $4 billion to $4.5 billion of property replacement value at risk. Add to that the auto damages and other lines of business covering infrastructure such as power and utilities equipment and it’s clear that the potential economic loss could be a record for a single tornado and that the insured loss from this event also has the potential to break records too. AIR said that it is important to note that the potential for damage within each buffer zone is not uniform and that on the outside of the buffer the damage could be much lighter than in the middle. As we wrote earlier today, ILS fund investment manager Credit Suisse said that it expects the insured industry loss from Monday’s tornado to be below $5 billion. Credit Suisse added that it does not expect any impact to any of its ILS or reinsurance-linked investment funds. Whatever level the insured loss from the Moore tornado, and the other tornadoes associated with recent storm outbreaks, reaches it is not expected to be particularly impactful to the market. Insurers and reinsurers are well capitalised and the markets have not suffered any major catastrophe losses in recent months, which means they will be able to absorb this loss. Property Claims Services (PCS) is expected to release an initial estimate for the insured property loss from this event in June. Loss estimates from risk modelling firms such as EQECAT, RMS and an update from AIR Worldwide will likely be made available over the next week or so. As we said in this article yesterday, there are a number of catastrophe bonds which are exposed to severe thunderstorm risks including tornado events. Of these it looks like four transactions are potentially at risk of having the event qualify as a loss which could erode some of the aggregate protection or deductible protection that the structures afford investors. Losses from this event are not considered to be high enough to threaten the attachment point of any exposed cat bonds. Some secondary market price adjustments are likely on potentially exposed cat bonds which could affect investor returns over the short-term. However principal losses are extremely unlikely given the aggregate nature of the most exposed notes, it is more likely that erosion of deductibles will occur and the deals could be a little more risky over the remainder of their current annual risk periods. The list below shows the cat bonds from our Deal Directory which are exposed to tornadoes and the ones highlighted in red are those thought at this time to be most at risk. We will keep you updated as the losses from this event become clearer. Skyline Re Ltd. (Series 2013-1) – Unlikely to be affected as sponsor The Cincinnati Insurance Company has said before (regarding tornado losses) that it does not market its P&C products in Oklahoma area, only life insurance sold in the state. 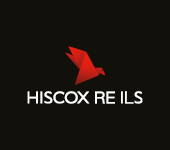 Residential Reinsurance 2012 Ltd. (Series 2012-2) – Unlikely to be affected as all tranches provide protection on a per-occurrence. Residential Reinsurance 2012 Ltd. (Series 2012-1) – Potentially affected as has aggregate coverage in force. Combine Re Ltd. (Series 2012-1) – Potentially affected as has aggregate coverage in force. East Lane Re V Ltd. (Series 2012-1) – Unlikely to be affected as all tranches provide protection on a per-occurrence basis. Residential Reinsurance 2011 Ltd. (Series 2011-2) – Potentially affected as has aggregate coverage in force. Residential Reinsurance 2011 Ltd. (Series 2011-1) – Potentially affected as has aggregate coverage in force. East Lane Re IV Ltd. (Series 2011-1) – Unlikely to be affected as all tranches provide protection on a per-occurrence basis. Residential Reinsurance 2010 Ltd. (Series 2010-II) – Matures in June, so despite having an aggregate tranche will not be a risk to investors.